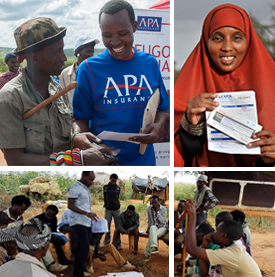 CNN’s Nima Elbagir today reports on the IBLI micro-insurance scheme in northern Kenya that is offering hope to farmers in the region. 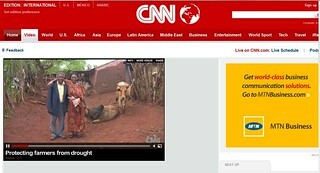 Speaking on CNN’s Marketplace Africa, Elbagir reports how, now the rains have come, farmers know they must prepare for the next drought that will inevitably come. Fifty-nine-year-old Wacho Yayo lost 10 of his 15 cows. These are the survivors. He can’t afford to replenish his herd, but thanks to livestock insurance that has been set up in this part of Kenya, he should afford to buy four new goats. Wacho Yayo is one of 650 herders who received compensation for the loss of thousands of animals. This initiative has been piloted by the Nairobi-based organization, the International Livestock Research Institute, and is backed by British and U.S. government development departments and the World Bank. And now there are plans to expand this project across northern Kenya and southern Ethiopia. This is such a remote and vast area it would be impossible to count all the dead animals. Images from U.S. satellites are used to quantify the loss of foliage in each area. This determines who should be compensated and by how much. Tags: CNN. Bookmark the permalink.